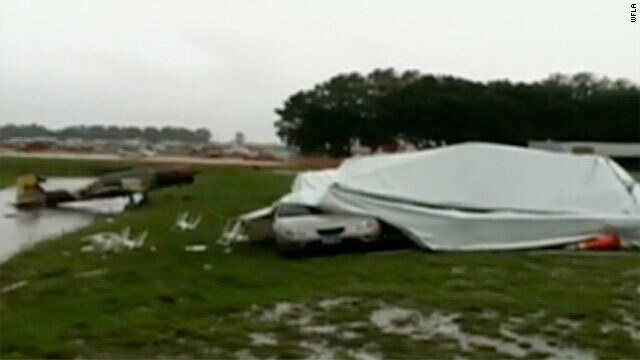 High winds in Lakeland, Florida, collapsed a tent and tossed an airplane into a ditch Thursday. [Updated at 1:58 p.m.] A photo on the website of Bay News 9 showed an overturned airplane at the St. Petersburg/Clearwater International Airport. The affiliate also broadcast images of damaged street signs and billboards as high winds swept through much of the region. In Lakeland, Sgt. Terri Smith said earlier reports that 70 people were trapped after a building collapsed at the Lakeland Linder Regional Airport are false. A heavy storm with strong winds hit the Sun 'n' Fun Aviation Fair at the airport, Smith said, causing "extensive minor damage and reports of minor injuries," but "all persons so far have been accounted for." [Posted at 12:21 p.m.] Severe weather tore across central Florida on Thursday, trapping about 70 people at an airport in Lakeland, and spawning an apparent tornado in Tampa, the National Weather Service said. Approximately 70 people were reported trapped in a collapsed building at the Sun 'n' Fun Aviation Fair at the Lakeland Linder Regional Airport in Florida due to severe winds, the weather service said. Y do u swim so much? You're right, I have to go, see you later, have to dispatch some merchandise. So long. Don't drink and swim. In the Middle East, a canvas structure might be considered a "building". I agree with many of the points made in this arlctie. You are very knowledgable and have written informative content. I'm hoping to read a lot more content from you.